Save Money will our Control System 3 Pak. Xtreme Scents Eliminator Body and Hair Wash is extra concentrated and formulated to provide long lasting scent free protection in the field. This effective blend is gentle on your skin and is biodegradable. 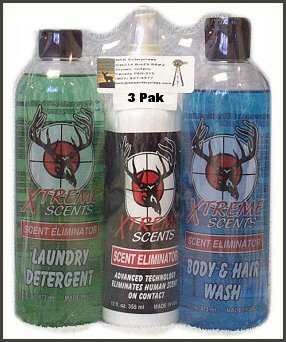 Xtreme Scents odor elimination line is not your ordinary scent elimination product. Chemically blended to eliminate scent-causing bacteria on the molecular level by stopping odors from forming gases. Effective up to 12-18 hours. Scent Spray comes in a 12 oz spray bottle Please note: Due to the extra weight of the Product additional shipping charges will apply. These charges will be added to your Visa - M/C purchase.